DUBAI, U.A.E., 17th January 2010 – Dubai was today unveiled as the Middle East venue selected to host the Louis Vuitton Trophy, a two-week carnival of elite sailing which will put the global spotlight on the UAE. Four spectacular 85-foot long America’s Cup Class yachts – sailed by world champions, Olympic medallists and round-the-world sailors – will be the focal point of the event which will firmly establish Dubai on the sport’s map. The prestigious Louis Vuitton Trophy – a true test of the crews’ ability with teams racing identical yachts - is one of the most coveted events in sailing and Dubai joins established premier regatta venues, including Auckland, Sardinia and Hong Kong, as 2010 hosts. It will be held at Mina Seyahi, the home of Dubai International Marine Club (DIMC) next to the Palm Jumeirah, while Emirates Airline – a leading sponsor - will be flying in many of teams and their armies of support staff, as well as race officials and spectators from around the globe. HH Sheikh Ahmed bin Saeed Al-Maktoum, Chairman DIMC, and Chairman and Chief Executive, Emirates Airline and Group, said: “This is a real coup for Dubai. We are honoured to be part of this fantastic event which has rapidly emerged as a renowned spectacle of sport followed by millions around the world. “As well as thrilling spectators both here and on TV, it will consolidate Dubai’s status as a venue capable of hosting major international sporting events. “We are also looking forward to welcoming our very own Emirates Team New Zealand back to these shores and, having won the Louis Vuitton Pacific Series in Auckland last year, confidence will be high coming into this event. The event – which gets under way on 13th November and will feature on-shore entertainment and a host of other activities - is also expected to put wind in the sails of the UAE tourism industry. Businesses throughout the UAE are expected to benefit after the organisers of the 2009 Louis Vuitton Pacific Series reported that the 14-day festival injected US$12 million (Dhs 44 million) into the Auckland economy. As well as Emirates Team New Zealand - featuring sailing great Dean Barker – and Artemis (Sweden), with the legendary Paul Cayard pulling the strings, the line-up is also expected to include: BMW ORACLE Racing (USA); Azzurra (Italy), TEAMORIGIN (Great Britain); Mascalzone Latino (Italy); Synergy (Russia); All4One (France/Germany); and Aleph Sailing Team (France). Yves Carcelle, Chairman and CEO of Louis Vuitton, said: "Louis Vuitton has been present in Dubai for more than 10 years. In 2010, we are thrilled to maintain this relationship through a great sailing event, while reinforcing the age-long Dubai tradition for regattas." Saeed Harib, President of the UAE Marine Sports Federation and CEO of DIMC, which will host the race, is delighted to be helping the growth of the sport in the region. “Dubai was host to the Emirates Team New Zealand Pro Am Series in 2006 and Alinghi and Victory Challenge boats during the winter of 2007,” said Harib. 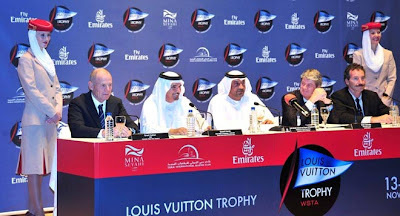 The Louis Vuitton Trophy – which is split into two five-day rounds, followed by semi-finals and the finals run over two days each - will mark the start of the Sea Dubai Watersports Festival, under the patronage of HH Sheikh Majid bin Mohammed bin Rashid Al Maktoum. The festival – now in its third year - will feature: the Dubai Shamaal World Surf Ski Championship; Oakley Riot World Wakeboard Tournament; UAE National Day Watersports Parade; Mina Mile Swimming Competition; Open Water Swim; Jet Ski Competition; Traditional 43ft Dhow Sailing Championship; and finishes on 11th December with the final round of the Class One World and XCat Powerboat World Championships.